The Art Department offers two majors, one in art history and criticism, and one in studio art. It also offers a minor in Digital Arts. The undergraduate programs in art are designed to provide the student with a thorough background in the history and criticism of art, as well as sound training in studio techniques and theory. The courses of study, while allowing students a considerable degree of choice, will also usually fulfill requirements for admission to graduate study or preparation for professional work in the field. Art history and criticism majors acquire a thorough foundation in the history of Western art and architecture, from ancient to modern, with tracks also in non-Western art, and such practical aspects of the discipline as gallery management. Studio art majors concentrate on the creative, technical, and practical aspects of the discipline, acquiring a broad-based background in drawing, design, painting, and sculpture, plus specialized tracks in ceramics, printmaking, photography, and digital and electronic media. In addition majors areexpected to acquire a sound foundation in art history and criticism with the emphasis on modernism. Art Department graduates who go on to work in the discipline usually acquire some post-graduate training, which may include anything from a few additional courses to such advanced graduate degrees as the M.A., M.F.A., or Ph.D. University at Stony Brook studio art graduates hold teaching positions up to and including the college level; others work as commercial artists, master printers, photographers and designers. Art history/criticism graduates hold teaching positions in colleges and universities; others work as gallery or museum administrators, or as art critics. The major in Art History and Criticism (ARH) leads to the Bachelor of Arts degree. With the major in Art History, the student acquires a broad background in art history at the foundation level, and then chooses from the full range of courses at the advanced level for a more thorough knowledge of art history in two or more areas of concentration. All courses offered for the major must be passed with a letter grade of C or higher. Completion of the major requires 39 credits, at least 18 of which must be upper division. Art History transfer students must take at least 12 upper division ARH credits for the major at Stony Brook. 3. Advanced: At least one 400-level seminar (ARH 400, ARH 420, or ARH 490). 4. Either two studio classes (ARS), or two intermediate level foreign language classes, usually French or German (especially for students planning graduate work in art history). Students may request approval for another language from the Director of Undergraduate Studies. Students must demonstrate acceptable writing skills in the discipline before they graduate. This can be achieved by completing a course designated as WRTD, such as ARH 308. Students should consult with the department advisor to ensure that their plan for completing the Upper Division Writing Requirement is consistent with university graduation requirements for General Education. Students completing the Stony Brook Curriculum (SBC) must complete a course that satisfies the “Write Effectively within One’s Discipline” (WRTD) learning objective to graduate. The Upper Division Writing Requirement is consistent in most cases with the SBC learning outcomes for WRTD. The major in Studio Art leads to the Bachelor of Arts degree. All courses offered for the major must be passed with a letter grade of C or higher. Completion of the major requires 57 credits. Studio Art transfer students must take at least 18 upper division ARS credits for the major at Stony Brook. Chosen from any of the above areas of concentration. May include ARS 475, ARS 476, ARS 487, ARS 488, ARS 495, ARS 491, ARS 492. Studio Art transfer students must take at least 18 upper division ARS credits for the major at Stony Brook. The honors program is open to seniors majoring in Art History and Criticism or Studio Art who have maintained a grade point average of at least 3.00 overall and 3.50 in the major. The student should apply for the honors program before the beginning of the senior year. The student must find a faculty member of the Department to act as sponsor. The student, with the approval of the sponsor, must submit a proposal of a project, in writing, to the Department. Acceptance into the honors program depends on the approval of the proposal by the Department. Selected students for the program must enroll in ARH 495 or ARS 495 for the semester in which they pursue their project. In the art history/criticism field, the student’s research project is supervised by the honors advisor. In the studio art field, the student is expected to prepare a small one-person show or similar project (i.e., one large, more ambitious work) in lieu of a thesis, under the supervision of the honors advisor. The student’s project is judged by a jury composed of at least two members of the Department of Art and a faculty member from another department. This pertains to students in both the Art History and Criticism and Studio Art majors. If the honors program is completed with distinction, and the student achieves a 3.50 grade point average in all art courses taken in the senior year, honors are conferred. With the minor in Art History, the student acquires a broad background in art history at the foundation level and may choose from the full range of courses to focus a more thorough knowledge of art history in one or more areas of concentration. All courses offered for the minor must be passed with a letter grade of C or higher. Completion of the minor requires 21 credits in art history, of which at least nine credits must be in upper-division courses. Art History transfer students must take at least 6 upper division ARH credits for the minor at Stony Brook. All courses offered for the minor must be passed with a letter grade of C or higher. Completion of the minor in studio art requires 21 credits. Digital technologies are reshaping all aspects of our culture; the arts and its related commercial and entertainment industries are no exception. 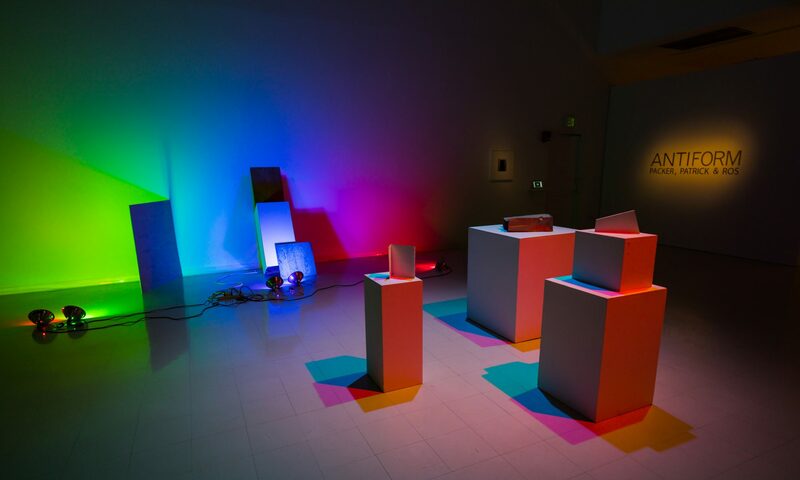 The Digital Arts Minor enables students to explore digital production tools in print, web, video, animation, game, CD, DVD, performance, installation, interactive experience, information visualization, and public space. In addition to production skills, the Digital Arts Minor builds critical literacy in reading and understanding images, sound, and information as well as in interacting in mediated social networks. It encourages creative thinking and problem solving, often cited as necessary skills for the 21st century and the pace of change in technology. The minor provides the education and fosters skills now crucial to being a citizen, consumer, cultural producer, and innovator in today’s global visual and information culture. This minor is particularly well suited for, but not limited to, students in Studio Art (ARS), Cinema and Cultural Studies (CCS), Computer Science (CSE), Multidisciplinary Studies (MTD), Music (MUS), Theatre (THR), Journalism (JRN), and Business (BUS). All courses for the minor in Digital Arts must be passed with a grad of “C” or higher. Completion of the minor requires 21 credits. Nine or more credits for the minor must be upper division. To earn a Digital Arts Minor students must take 1 Core course (category A), 1 Foundations course (category B), and 1 Intermediate Production course (category C). Students must also take 1 additional production course chosen from categories C or D, 1 Theory and Culture course chosen from category E, and 6 additional elective credits chosen from categories C, D or E.
No more than six credits from any 488 internship may be applied to the minor. No more than three credits from 487 may be applied to the minor. Pre-approval for appropriate 487 projects and 488 internships is required. The College of Arts , Culture, and Humanities—located in the five residence hall Tabler Quad—will give students the ideal context in which to explore their artistic creativity and cultural curiosity. The new Tabler Center is the jewel in the Tabler Quad crown, a 10,000 square-foot playground for exploration of the arts and humanities. When completed in 2004-05, this state of the art complex will house a 250-seat performance space for theater, dance, and music, a radio and television studio, an art gallery devoted exclusively to undergraduate works, practice rooms and artist’s studios, a digital arts laboratory with the latest arts software, a conference hall and classroom. The Tabler Café will serve food and a private dining room will be available in which classes and clubs can eat and talk, and students can gather to discuss projects, events, or simply relax together.